To no one’s surprise, the Federal Reserve lifted its target rate, during a week that highlighted a long-term economic pattern of inconsistent growth. Once again, Retail Sales failed to move, Industrial Production fell, and inflationary indicators continue to show very moderate pressure. However, rates continue to press upward. Much of the movement has been attributed to the Fed’s predictions for next year, along with traders moving into a protective stance as they head out on holiday breaks. All-in-all, this has become an ongoing pattern. Each year, we believe that rates will climb in the coming year. In 2015, we finally got the first increase in nine years on expectations of about four increases. 2016 followed the same patterns with only one increase on expectations for about three increases. 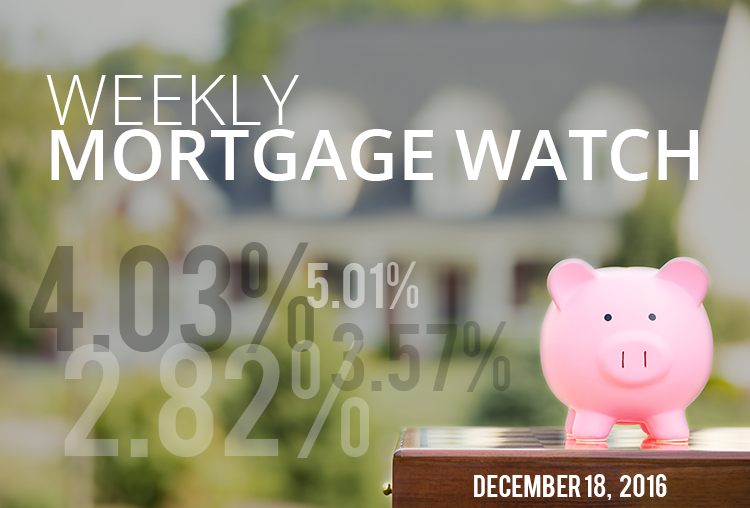 This week could see rates continuing to move upward on thinner trading volumes and continued chatter about how 2017 will be the year of increasing rates. The “final estimate” is due for the 3rd quarter’s GDP. Even if it is tugged back slightly, rates do not have much room to move downward. The annual America’s Health Rankings from the United Health Foundation have been released, with Hawaii topping the list as the healthiest state. The ranking accounts for many factors and highlights good trends, such as the decrease in smoking, and bad trends, like the increasing rate of babies born with opioid addiction. The top ten states round out with Massachusetts, Connecticut, Minnesota, Vermont, New Hampshire, Washington, Utah, New Jersey, and Colorado.